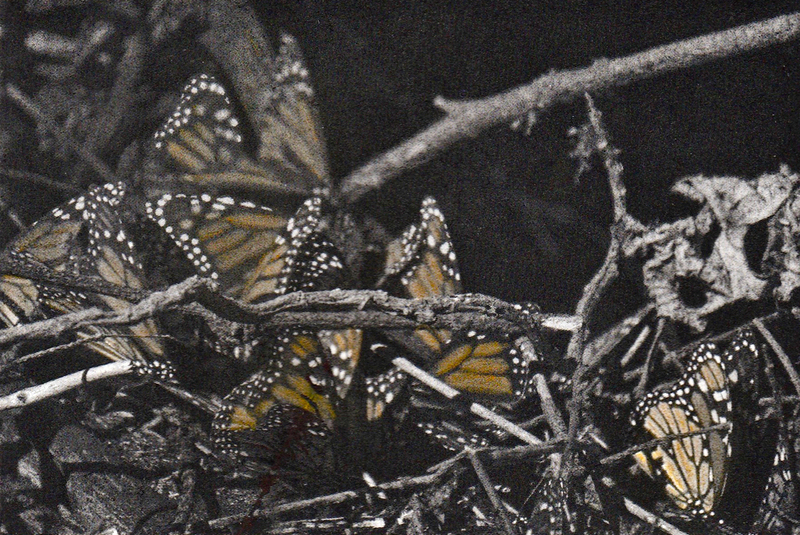 Liz Menard, Roosting Monarchs, 2019, etching, aquatint and handcolouring on Washi (Japanese Paper), size variable. Price available upon request. Liz Menard, Puddling, 2019, photo-etching with hand colouring on Kozo paper, paper size: 4” x 6”. Photo courtesy of the artist. 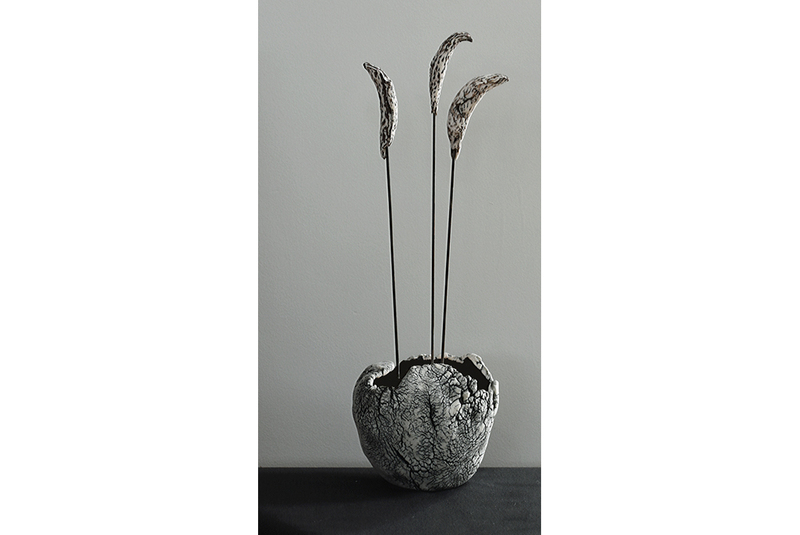 Liz Menard, Pods, 2018-19, stoneware, size approximately: 18” x 6”. Photo courtesy of the artist. 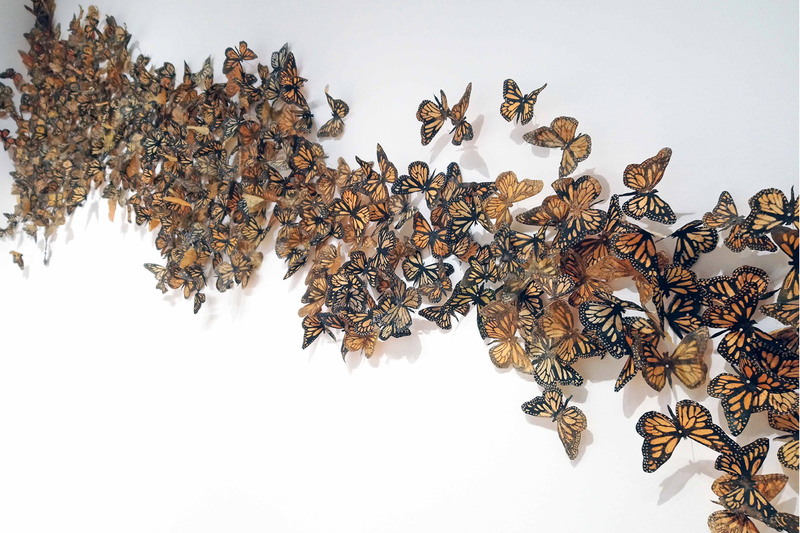 Monarchs, Mexico and Milkweed are the focus of Liz Menard’s current work in progress. In September 2015, she was an Artist in Residence at Playa in Oregon’s high desert. Playa is adjacent to a six-mile lake that dries up each summer. This extreme otherworldly landscape was arid and barren. The dry, cracked lakebed resembled clay. Menard spent her days wandering, collecting, sketching, photographing and creating prints. When she returned to Toronto, she began working in clay. She realized her pots resembled the dried lakebed. Then, the pots became pods – milkweed pods. In February 2016, Menard travelled to Michoacán, Mexico to see monarchs in their winter habitat. While travelling up the rugged mountainside, only a handful of butterflies were spotted. However, at the top, in a protected grove of fir trees – looking amazingly like Algonquin Park –the monarchs rested. It was breathtaking: over 4,000 kilometres from their Ontario birthplace, hundreds of thousands of monarchs were clinging to Oyamel fir tree branches in tight clusters – looking like autumn leaves. As the sun rose and touched each branch, it warmed the butterflies causing them to burst apart in a fluttering mass of colour. It was magical. Liz Menard was born in Agincourt where she continues to live and work. Her lifelong love of nature and the natural world shapes her practice. Menard is curious about natural and manufactured landscapes, ecosystems and habitats and the native and invasive species that struggle to survive. Menard wanders, collects, researches, photographs and draws, bringing together divergent ideas for her prints, artist’s books and print based installations. Participating in artist residencies feeds her curiosity. Menard has an extensive solo and group exhibition history. Recent exhibitions include: Prints & Drawings, Arts & Letters Club; Print Matters, First Canadian Place, Toronto; Landscapes Near and Far, Santander, Spain; The Forest and the Trees, Grimsby Public Gallery; Un/Natural, Quest Public Gallery; and Environmentally Friendly Print Practices, McMaster University Art Gallery. Menard’s work is found in many public and private collections here and abroad.